The kids and I went to a friend's house yesterday and tie-dyed some clothes. It was pretty fun and the results were spectacular! click on the picture to be taken to flickr to see the clothes up close. 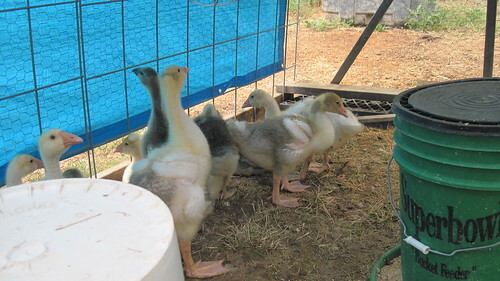 Look how big these goslings are getting! They came to live here three weeks ago today. Here is a picture that might help you get some perspective. Look how small they were! 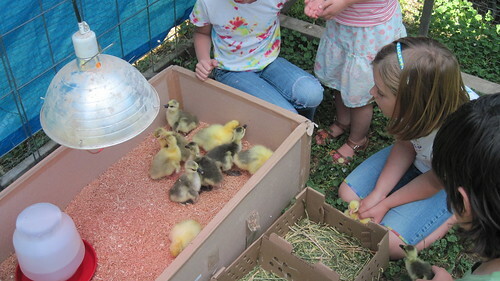 But they were three times the size of a baby chick! I have picked over five gallons of raspberries in the last ten days. I have made about 3 gallons of raspberry jam, and one-third of that was seedless. Three of the kids have swimming lessons every day. When I have a chance to get online, somehow I forget that I even have this blog. There are three more weeks until part of the children go back to school. I'm sure by then the rest of the garden will require all my attention. I hope you're having a good summer, too!